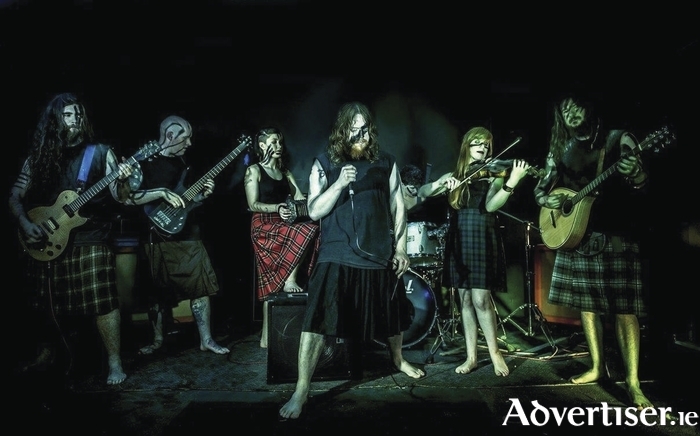 NA CRUITHNE, the folk-metal sextet, who fuse groove and black metal with the traditional musics of Ireland, Scotland, and Brittany, launch their debut album, Gairm an Fhiantais, with a concert next week. The band was formed in Galway, inspired by the local trad scene, as much as by metal (they play fiddle and bouzouki as well as electric guitars ). The album launch gig is in Sally Longs tomorrow night at 9pm, where videos for their songs 'Fhoinnuisce' and 'Bultúr Marú', the latter animated by Slovenian graphic designer Tia Friedel, will also be screened. Lyrically the band steer away from the mythology/fantasy staples of folk-metal, with nature and animals being prominent instead - hence songs like 'Mac Tíre' (Son of the Land/Wolf ) and 'Bultúr Marú' (Vulture of Death ). The Irish language features heavily with almost half of the songs on Gairm an Fhiantais as Gaeilge. The band play the semifinal of the Bloodstock Metal to the Masses competition on April 29 and the Metaldays festival in Slovenia in July. Page generated in 0.1030 seconds.